From the Khan Academy website:"With a library of over 2,700 videos covering everything from arithmetic to physics, finance, and history and 238 practice exercises, we're on a mission to help you learn what you want, when you want, at your own pace." Shmoop has thousands of practice problems, step-by-step examples, graphs, and real world math applications for pre-algebra and algebra. Need help with your Algebra homework? Studying for an upcoming test? Check out Algebasics for step-by-step demonstrations of solving problems. Mr. Robb has posted hundreds of how-to videos covering everything from solving differential equations to using a graphing calculator. Stuck on a homework problem? Need some help practicing problems before a test? Check out Mr. Robb's videos at: http://www.youtube.com/user/RobbWorld. Math Words contains hundreds of definitions, formulas, and examples. A great resource! From the website: "This website is designed for math students who need an easy-to-use, easy-to-understand math resource all in one place. 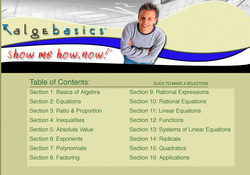 It is a comprehensive listing of formulas and definitions from beginning algebra to calculus." Check out Math Words here.